In 1977 George Lucas’s Star Wars was released in cinemas all over the world. The film revolutionised the cinema industry, and the two sequels, The Empire Strikes Back, and The Return of the Jedi were equally successful. Around the films has been built a massive merchandising industry which seems set to grow as a new generation of fans arrives willing to buy figures, comics, posters, autographs, cells, games, puzzles, light sabres, masks, stationary, videos of the films, videos of the making of the films, display pieces, promotional material, Pez dispensers, Tazos etc etc etc. Outside of the main characters which we are all so familiar with, there was a cast of hundreds. 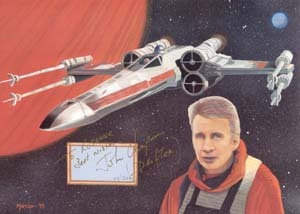 At a recent collectors show WCN met John Chapman who played one of the X-Wing Pilots in the briefing room scene. 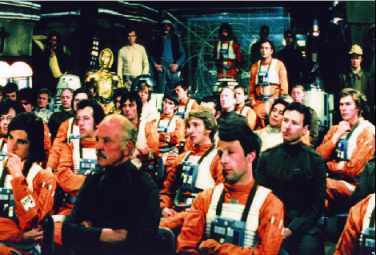 This scene never made it into the final cut and eventually only the scene with the back of the X-Wing pilots viewed. The lost briefing room scene still exists and has caused a lot of debate among die hard fans. His character Gil ‘Drifter’ Viray was one of the survivors of the assault on the Death Star and John also appeared in the end ceremony where Luke, Han and Chewbacca are awarded medals. John Chapman is attempting to find other members from the lost briefing room scene to have a re-union. He is also attempting to develop his character further with stories of Drifter’s adventures after Star Wars. Although in only a small, non-speaking part John Chapman is developing a fan base, especially among completist Star Wars collectors, who just have to have everything associated with the film. As well as attending memorabilia fairs, John has been a guest at several Star Wars conventions where he has been surprised by the interest in his character. “I’d never bothered with the convention circuit as I didn’t have speaking part, I was just one of the extras in the briefing room scene”. Will Drifter memorabilia be collectable? Probably not, but to the many Star Wars fans out there, this is another slice of unusual Star Wars history that adds a new dimension to their collecting.